In 1978 Seddon Atkinson introduced the light weight 300 Series which remained in production until it became the 301 Series in 1982 being the last range to get the '01 update. Originally the 300 Series had been developed at the request of Pandoro, who wanted a lightweight British built tractor unit after their disastrous experience with Leyland Buffaloes and subsequently had twenty five in their fleet. As regards W & J Riding the preferred choice was the '400 Series' so they only actually ever ran one '300 Series' 4x2 tractor unit which was purchased second hand in 1984. 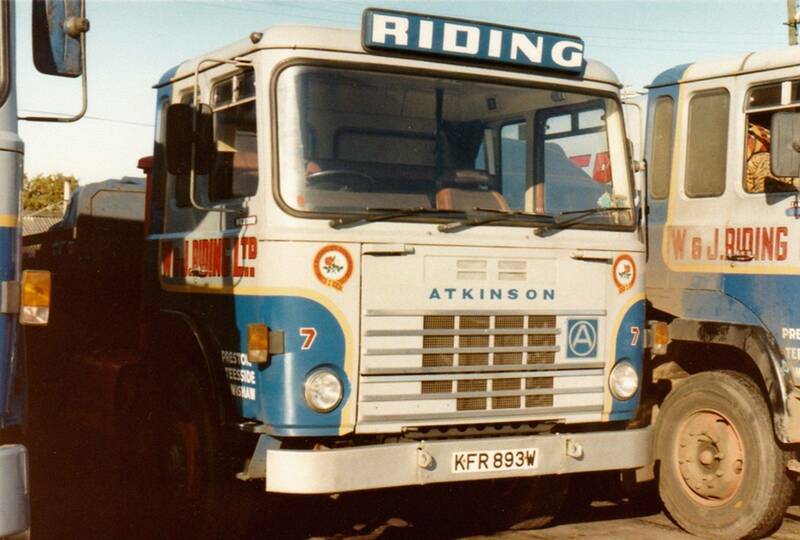 The only Seddon Atkinson 300 Series 4x2 tractor unit to enter service with W & J Riding was Reg No KFR 893W Fleet No 7 ‘Meteor’. Originally registered new on the 1st of June 1981 it was purchased second hand by Riding's on the 12th of September 1984 at a cost of £5,500 plus vat. Powered by an International 460 engine it was driven by Albert Robinson and was allocated to the phosgene cylinder job out of the ICI Burn Naze plant. “I bought a business consisting of three vehicles, including this 300 series, from a friend of mine the late Leon Donkin who was the boss at Pandoro at Preston Dock and later at Fleetwood Dock after the closure of Preston. Leon traded as L.J. & M.D. Transport operating three vehicles privately but on realising that it wasn't paying he decided to get out of the business”. After being in service with Riding's for three years KFR 893W was withdrawn from the fleet on the 30th of December 1987 after which time it was broken up and scrapped.